[Newspaper clipping] "Do you remember when? How many of these students in the sixth, seventh and eighth grades can you identify? Arthur 'Red' McVey loaned this picture to the Review and Miss Lucy Pollard was able to identify everyone in it. 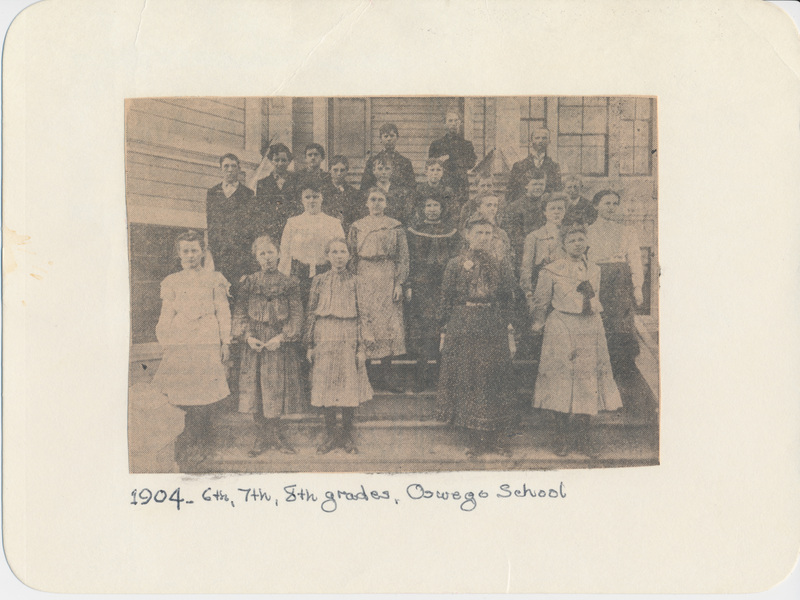 The year was 1904, the place the Oswego school when it was a three-story structure, located on the same site as the present Lakewood school. Left to right, first row, are: Alice Bruns, Gladys Nelson, Lillian Hall, Lucy Pollard, Leona Jarish. Second row Della Nixon, Jessie Creek, May McGuire, Bessie McCutcheon, Mable Elston, Silver Prosser. Third row, Vernon Nelson, Lloyd Harbin, Joe Chuck, August Dhooghe, Herman Mair, Fred Rosentrator, Rudolph Erickson, Harry Pollock, Arsenius DeBauw. Top row, Henry nagel, Lester Clinfelter, and Prof H.T. Evans, who was teacher and principal for 18 years. Vernon Nelson and Lester CLinefelter were eighth graders,"--Oswego Review, Dec. 26, 1957. [Handwritten] 3 girls in 8th grade: Silver Prosser, Mabel Elston, Della Nixon. Description [Handwritten on front] 1904 6th, 7th, 8th grades, Oswego School. Mounted on tag board. Transcription [Newspaper clipping] "Do you remember when? How many of these students in the sixth, seventh and eighth grades can you identify? Arthur 'Red' McVey loaned this picture to the Review and Miss Lucy Pollard was able to identify everyone in it. The year was 1904, the place the Oswego school when it was a three-story structure, located on the same site as the present Lakewood school. Left to right, first row, are: Alice Bruns, Gladys Nelson, Lillian Hall, Lucy Pollard, Leona Jarish. Second row Della Nixon, Jessie Creek, May McGuire, Bessie McCutcheon, Mable Elston, Silver Prosser. Third row, Vernon Nelson, Lloyd Harbin, Joe Chuck, August Dhooghe, Herman Mair, Fred Rosentrator, Rudolph Erickson, Harry Pollock, Arsenius DeBauw. Top row, Henry nagel, Lester Clinfelter, and Prof H.T. Evans, who was teacher and principal for 18 years. Vernon Nelson and Lester CLinefelter were eighth graders,"--Oswego Review, Dec. 26, 1957. [Handwritten] 3 girls in 8th grade: Silver Prosser, Mabel Elston, Della Nixon. Physical Description H 4.5" x W 6"